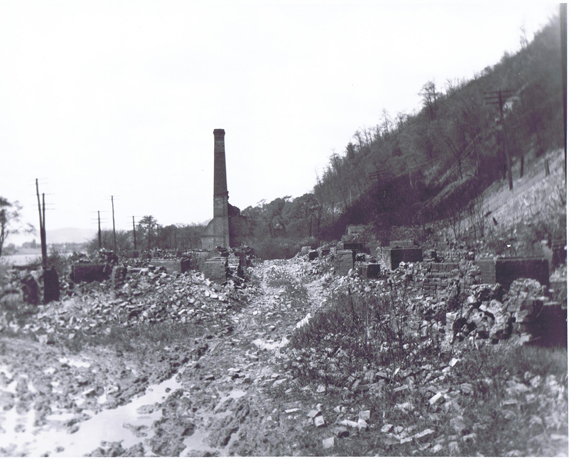 In the halcyon days at Walkers, a hamlet a more than 30 homes which were all numbered and in which more than 200 persons resided, situated midway between East Liverpool and Wellsville, there was at one time a roller skating rink. 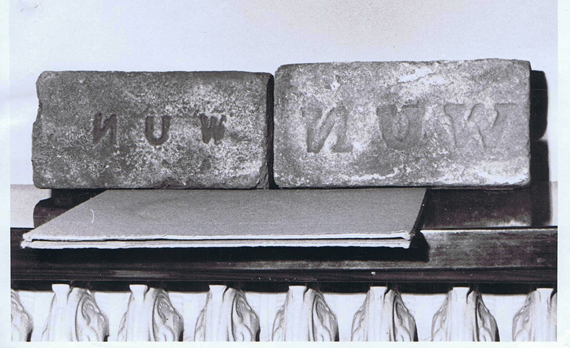 it was a community departure and had the additional distinction of being one of the highest located in the Ohio Valley locality for it was upon the third floor of one of the two reconstructed plants which in those days was operated by the late N. U. Walker for whom the place had been named. Our swimming hole, "The Rocks" at Walkers on the Ohio River, East Liverpool, Ohio. about 1939. There are yet residing in this immediate vicinity some of the young lads who had the opportunity for skating upon this unique floor. Among them is Harvey Bailey of Newell. He is a brother of John Bailey of Chester. Both of them are distantly related to the late Frank Jones, the once famed stage comedian, who made a reputation all over the country by reason of his play, "Si Hopkins," which carried as part of its equipment a "Farmers Band." This later musical aggregation was widely known. John and Harvey Bailey are the sons of the late Jesse Bailey. The family home was in the West End near Jethro. There was a depot. 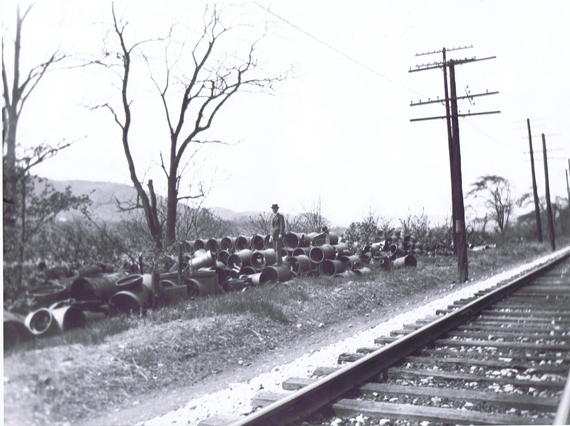 Mr. Bailey recalls, in Jethro, It consisted of just a platform which was situated to the west of the run and upon the north side of the single track which then formed the railway connecting Cleveland and Pittsburgh. 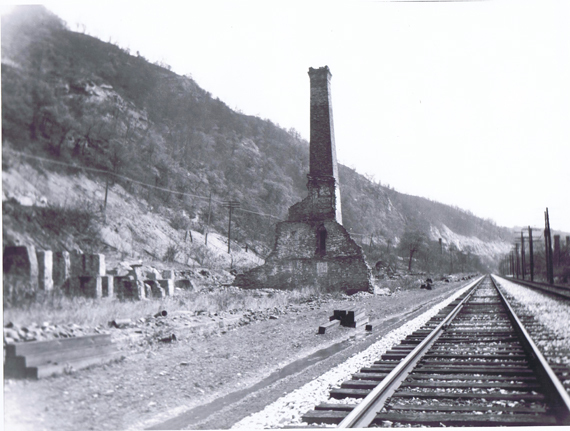 There were thus two stations between East Liverpool and Wellsville in those early days, that at Jethro and the other at Walkers. The latter, Mr. Bailey recalls was upon the southside of the railway track and just in front of the store operated by N. U, Walker.. The latter was a large mercantile establishment and consisted of stock of a general nature. The basement of this establishment is yet visible along the railway tracks, the stone in it having for the most part remained in their former positions. 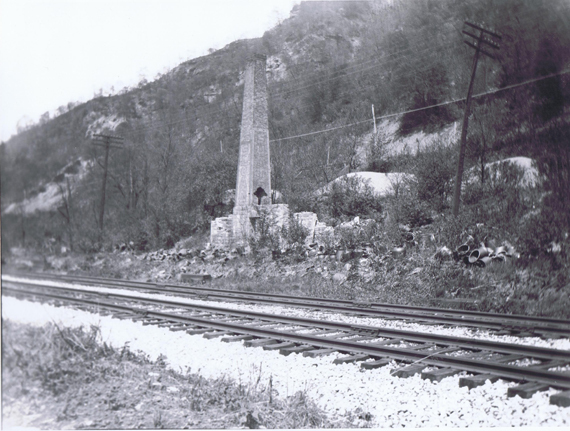 There were two tile plants in operation at Walker's during the days of the little towns activity. 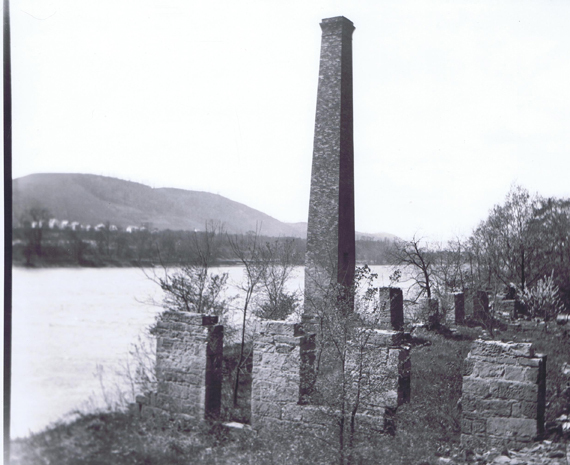 The lower one, that nearest to Wellsville, was destroyed by fire. When it was reconstructed an additional story was added to it, Harvey Bailey recently recalled. The late T. F. Anderson had charge of the construction, he said. There was much conjecture regarding that which was to be done upon the third floor. It was noted that the floor this large room had been constructed of hardwood. And finally a horse was taken into it and used for several days and dragging a large stone over the rough surface of the wood used in the flooring. In those days would was not finished with machinery in the manner in which it later came to be done. Then, according to the memory of Mr. Bailey, came surprise to those in the little hamlet and connected with the activities about it. For upon a certain day some 50 or more pairs of roller skates were shipped to Mr. Anderson. He then announced that all who care to do so could use them upon the recently arranged floor in the upper section of the new plant. Mr. Bailey recalls that he himself was among the number of young lads who availed themselves of the opportunity of skating over this carefully prepared floor. He remembers that Mr. Anderson was himself a proficient skater and was among the best of the ice of the ice-skaters in this locality in his younger years. The late Elza VanDyne, he said, was another fine roller skater of those days. Among others who stood out in their capabilities upon this Walker floor were said to of been the late Joseph Antonnina and Sherman Maneypenny. Among the memories of Mr. Bailey regarding Walker's is that of the fact that James Moore and Michael Bryan, were among those who were employed as storekeepers in the Walker store. The latter was the brother of Thomas Bryan, who long was the plant foreman in the manufacturing carried on. He said that the late John McDonald was another of those who had been employed in this capacity. Clays for the plants at Walker's were procured from the hillside just North of them. 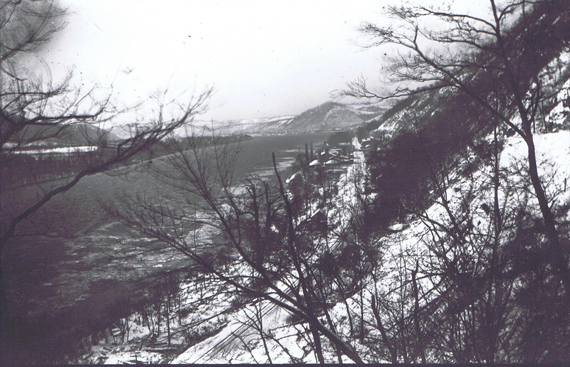 In those days there was a Street railway just alongside the Hill. He remembers that from one of those mines was procured a certain shipping Clay. It was always sent to distant points. 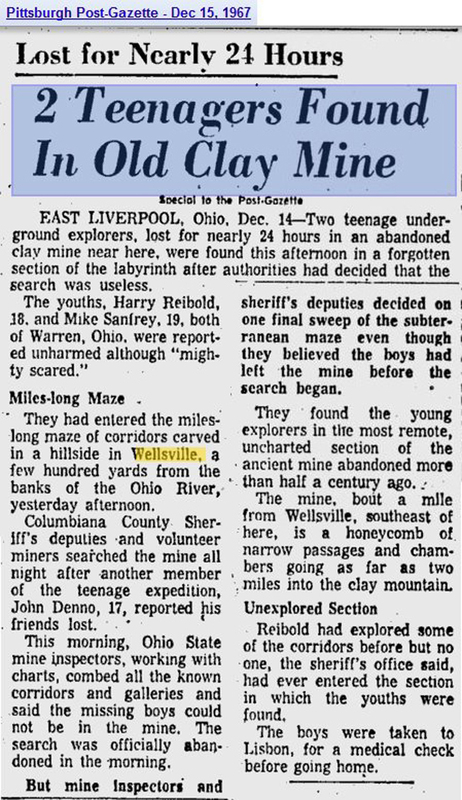 The clays from these mines were transferred from the Hill recesses by means of tracks made of iron. These laid upon high trestles as the plants, the upper and lower one, were reached. It was possible the thus to easily load that to be shipped away in cars in the switches alongside the factories. 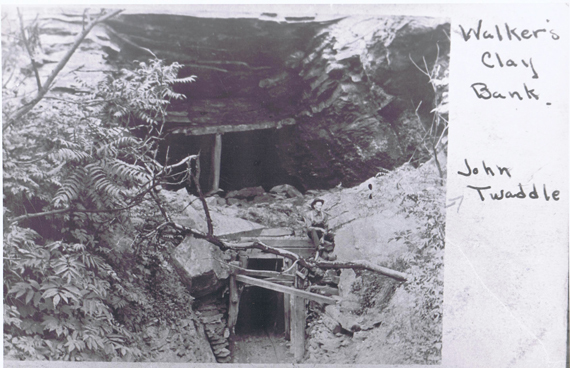 Some of these mines were opened in higher sections of the hill than other. It was in this manner arranged to get out of it all the known veins in it. In some instances the bed of coals also procured from this same hillside. There are remains of the openings of these mines yet visible in this hill. Some of them are completely closed, however. But it is easy to visualize in an inspection of this steep hillside the once activities in, upon and about it. 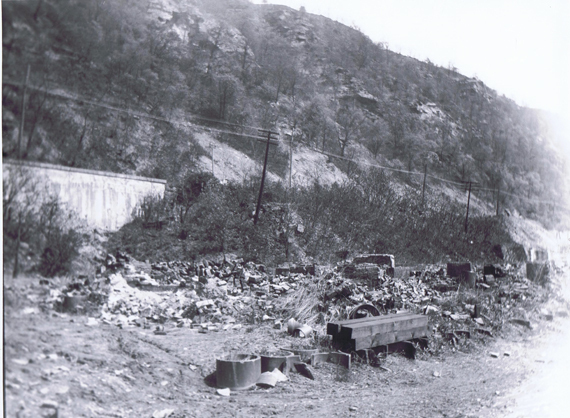 In those days when Walker was an active spot between East Liverpool and Wellsville, Jethro was also a community that carried on its own business while utilizing the depot for transportation. The store and Jethro in those days was long maintained by Frank Bagley. He was assisted by J. Usselton. This store was also upon the West side of the creek which flows under the railroad tracks at this point. It stood upon the South side of the railway track, just opposite to the depot. This store was eventually destroyed by fire. Another industry in Jethro a salt works the time was a salt works owned and operated by James Mears. It was maintain an one-story structure and was situated in the hollow near the bridge which once covered the creek and upon which the street railway tracks were laid. 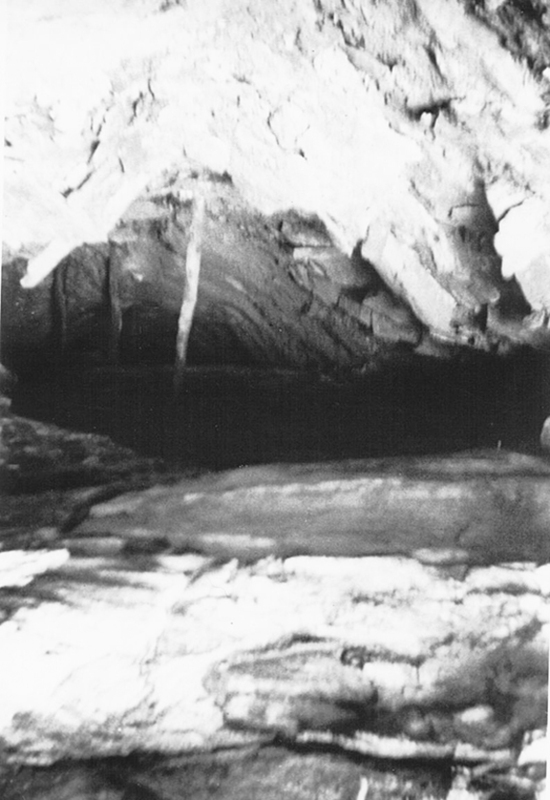 Mr. Bailey recalls the vats that were utilized in this departure and often in his younger years watched the process of boiling that was necessary to obtain the salt. In subsequent years the plant was abandoned and the work of procuring salt in this vicinity discontinued. One of the memories of Mr. Bailey regarding those Jethro and Walker days is that persons living in them thought of going to East Liverpool and Wellsville in turn both by night and by day whenever they felt the need of doing so. And usually the trips were negotiated on foot. Evenings were spent in both places and it was expected that persons going and coming should be met in both directions. Always the railway track for the most part was used for walks by these pedestrians. 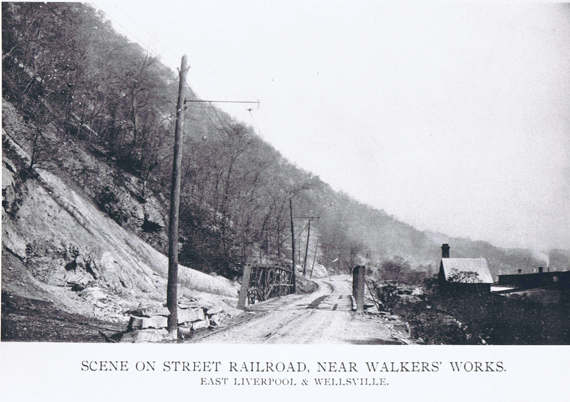 The roadway between Wellsville in East Liverpool at this time was situated along the river for considerable distance. It crossed and re-crossed the tracks between the two towns. 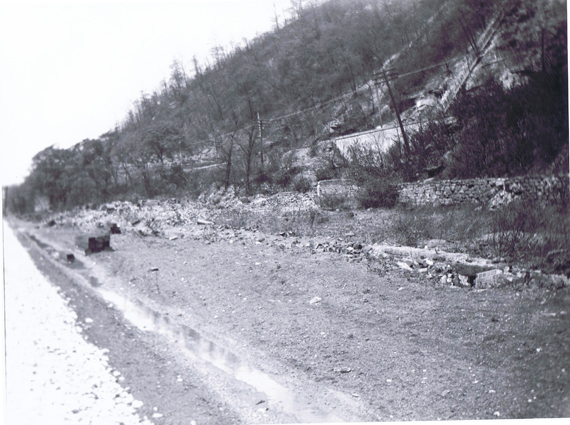 In later years the road was transferred to its present location alongside the Street railway beside the hills fronting the river. It was long used before the subsequent paving. Above Walkers looking towards Wellsville. Mr. Bailey as many pleasant memories of the late Frank Jones and his show, This rural play was one that made for general appeal throughout the country. He himself joined his traveling aggregation in 1892. Before that his brother, John Bailey, had been connected with it, he said. Mr. Bailey declared that he and his brother became interested in stage activities largely by reason of personal acquaintanceship with the late William Bridge, who preceded his son of the same name in active work as Bill poster. Before that he was also a director of the work upon the stage and exceedingly cave full and that which he did their thereon. 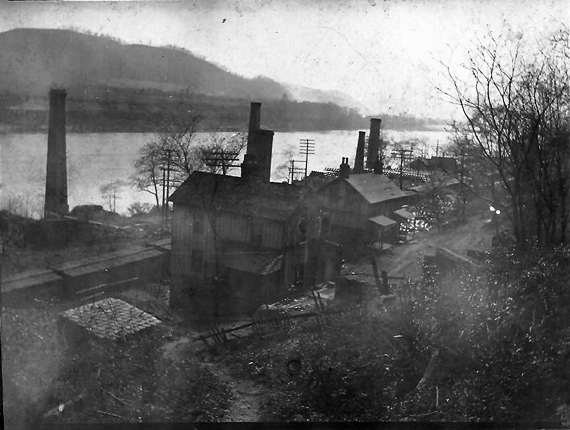 In this manner the brothers came to know much about properties of many of the companies which in those early days visited East Liverpool. Particularly did they know those attached to the "Si Perkins" show. It was thus but a matter of little effort for Harvey Bailey to carry out the duties expected of him when he joined the company at Wheeling. With this company he toured a large portion of the country. He said that Frank Jones was very popular everywhere he went and unusually so with the members of his own aggregation. He was ever given to talking about his early days in or about Pughtown of Fairview, W, Va. And he would often referred to the friends and relatives who yet resided in that locality. Mr. Bailey related that it was always a custom of Mr. Jones to write in advance to many of his relatives and friends before his arrival here. thus he was enabled to see and greet them again. This custom the always followed in other places where he had the benefit of close friendship with persons in them. 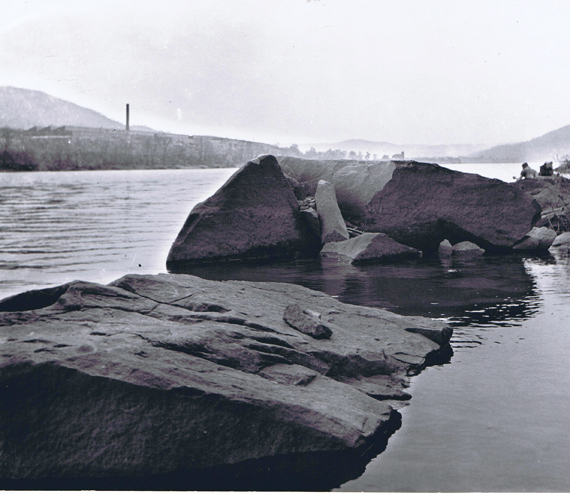 One of the pertinent memories of Mr. Bailey regarding Frank Jones is that once upon a time and the company was in Wellsville and he carried out his own suggestion to throw a gold watch owned by a musician into the waters of the Ohio alongside the city. And to this day this rather valuable timepiece doubtless lies in the bottom of the stream at this point. It so happened that one of the members of the farmers band was leaving the show and Wellsville. He had been paid off. He went about the town with some of those he was leaving and found, though just paid off, that he had spent his money. He needed the price of the ticket to his home. Meeting Mr. Jones he told him of his predicament and offered to put up his watch for the sum tendered him. Mr. Jones agreed upon the privilege of being permitted to throw the time-piece into the water. The owner gave his consent to did not think the show owner would carry out his suggestion. The entire party, thus gathered together, went to the riverside. There the new owner of it drew back his arm and hoisted it into the following waters before them. The man received the sum he asked for and the watch was thrown away as per the suggestion which all made for interesting incident to recall in later days upon the road. 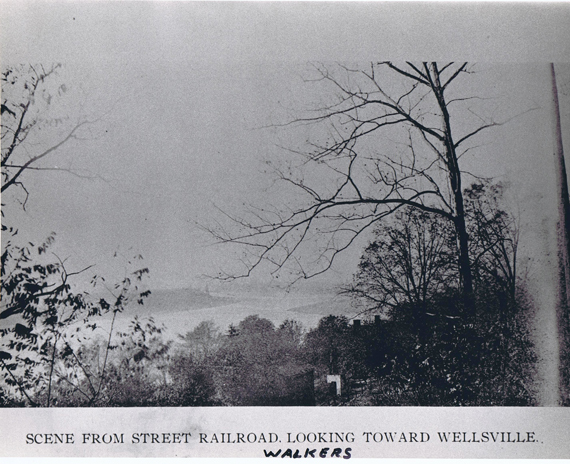 Walkers Between ElO and Wellsville in 1930's. Picture is dated as 1936. There are other pictures here that are listed as 1922 that doesn't show standing buildings so this picture may be a lot earlier than 1936. 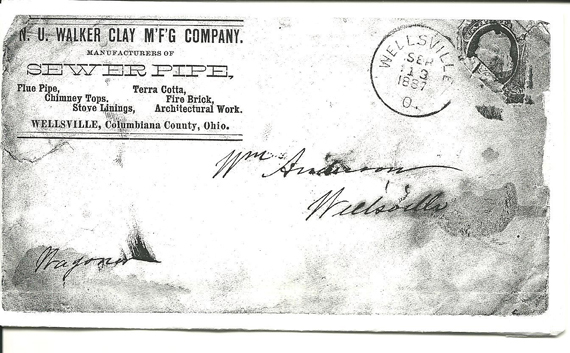 Picture courtesy of Wellsville Historical Society via "Ole Nib". 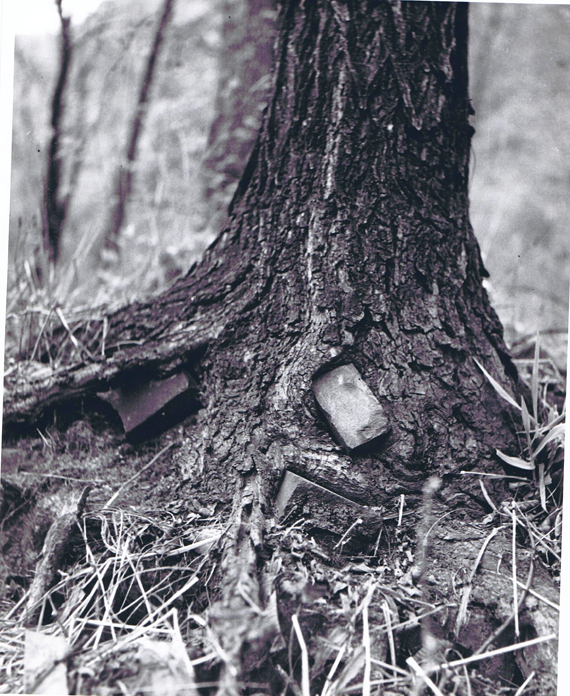 Picture courtesy of Wellsville Historical Society via "Ole Nib".